The after school program I work at has been making little paper houses, bigger paper churches and more. 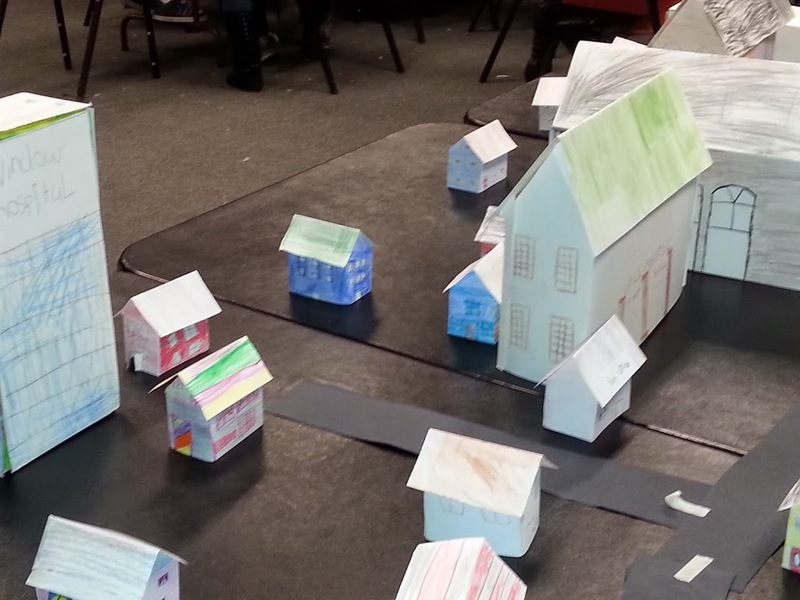 The Paper City Project introduces maps in a 3D lesson on the students home town. The cold winter days lent themselves to coloring tiny buildings and cutting them out. From a simple hand drawn pattern the basic houses were crafted and the small collection grew along a window sill. We had a date for the display to be shared and we worked toward it. Snow cancellations, and a Monday holiday and more kept us from making as many buildings as we first imagined but we made a fine representation. This view is less than a quarter of our city. We talked our way through the layout of the city by starting where we were and moving out from that point. Students had different buildings they were familiar with. Library, post office, schools, hospital and favorite food outlets were pretty easy. 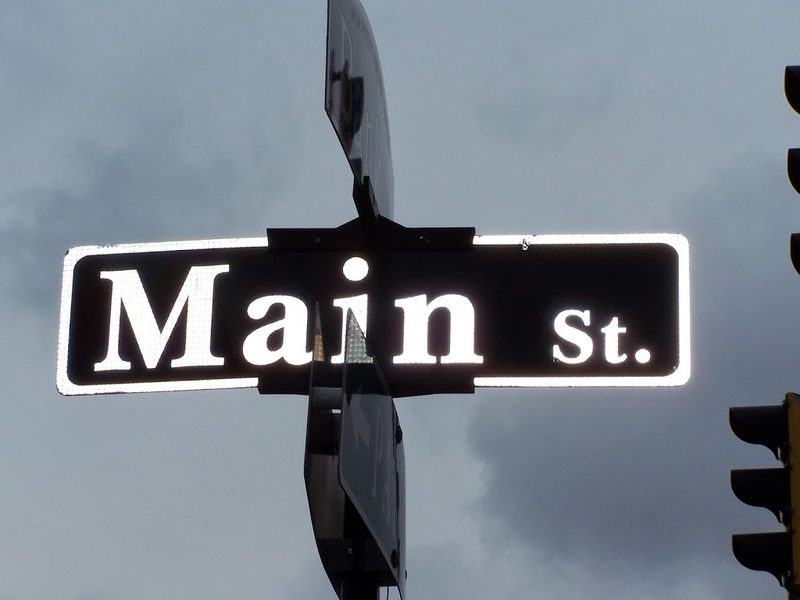 Smaller shops and businesses brought a lot more discussion as to which side of Main St and where in relation to certain churches or other dominant buildings. The entire discussion and placement process went well. Strips of black construction paper became our roads and wavy blue pieces the Willimantic River. Students learned about Willimantic history, some heard the story of the Frogs of Windham, which is why we have a bridge with huge frogs on it! http://www.damnedct.com/the-frog-bridge-willimantic/ This story took place in 1754 in Windham, the town Willimantic is a part of. 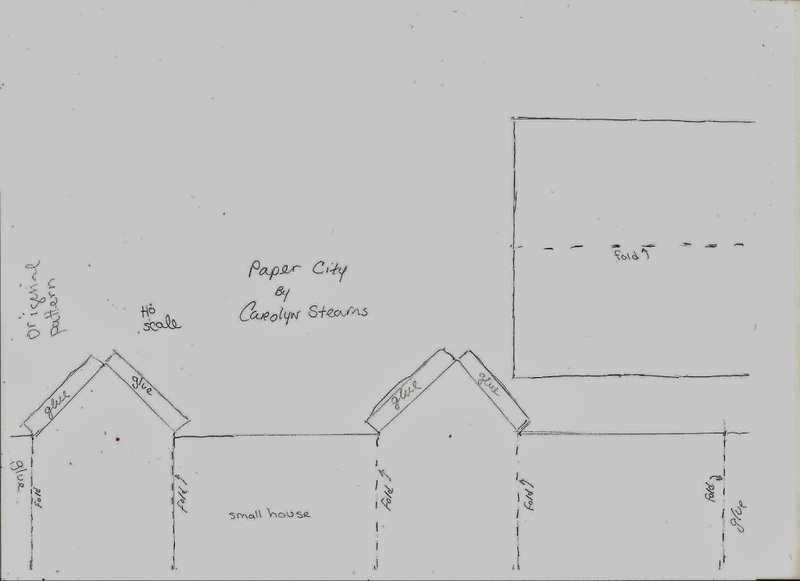 Here is an image of the plan I drew for the smaller houses. For the youngest students I outlined the cutting edge in colored pencil. Once cut out and the students name added we folded the creases and then flipped the house over to color on the windows, doors, siding and accessories. Some of these also became small businesses like Cafemantic and the Shoesmith. The final piece colored was the roof. Then we used glue sticks to assemble the house. A companion activity to this was a timeline around two sides of the room. Our theme for the month was Decades, so it was broken out in those increments. There were many pictures of historical Willimantic along the timeline. This was a fun project for the middle of winter and one I would do again with the kids. This was fun too, but if you are in New England you will have to wait for better weather!